To the maddening crowd and my thousands of adoring fans, I say thank you. Thank you very much! 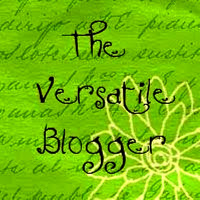 Today I was blessed with The Versatile Blogger Award. I'm always thrilled when I am recognized by another blogger. This is a blogger to blogger award and it makes me happy that somebody likes my blog. Lori@The Stonybrook House bestowed this honor upon me and I thank her. Thank her very much. This means I am supposed to thank her - check, tell you 7 things about myself, and then pass the award on to 15 (15!!!) other bloggers. In all honesty I was also granted this award back on March 28 by Pricilla@Thrifty Crafty Girl and I started trying to thank the academy at that time (and I did thank her - just not publicly). So now I am shamed into finishing the post. If your wondering what held me up - well it was several things. I'm a little shy about these blogger to blogger awards because they are strangely akin to chain letters and I've never been a chain letter kind of girl. However today when I was reading Lori's post I was struck by her comment that The Versatile Blogger Award should be regarded more like Friendship Bread - (you know the yummy cinnaminny goodness made with a starter mix that comes with the bread - for you to make more bread and starter to pass along). The second thing that held me up was the whole 7 things about myself thing. I feel like I have told you everything interesting already. (how do people who have been blogging more than 4 months not run out of things to say about themselves?) So I was left wondering if I should let you figure out how truly lame I am or tell you the same things I've already said before. Now I am telling myself "Silly Karen, you flatter yourself, they haven't read every word you've ever written." "Oh" I reply back. I have never owned a new couch - you know like one you buy at the store. It is my dream. The slipcover/upholstery I put on my couch in 2006 is getting tired. Maybe this will be the time in my life that my dream comes true. I don't like to shop (except for estate sales) I get overwhelmed by all the things I don't want, as well as all the things I want. It is just too much. For clothes I usually shop in familiar stores online or go in one small store and spend my entire budget and go home. I have no idea what is in style - I don't really care. I could wear a black turtleneck and straight long skirt every day of my life and be happy. I have a sweet tooth (and fat tooth) like nobody's business. Since I got my braces the only food that tastes right are desserts and that has made it worse. Today is my son's birthday. I have always called him Beautiful Son. There is no phrase that passes through my mind that makes me happier. The only thing I don't feel ultra confident about cooking is meat. This is probably because I don't practice cooking meat. I would much rather make a HUGE and satisfying pasta dish - which may or may not contain meat. Now to pass it on - to 15 blogs I really like for many different reasons. They are versatile bunch! Check them out and let them know you like them too! Whew! It is hard work looking through all those blogs! I must run now - because I have to email them to notify them of their awesomeness. I know you were here today to see the tutorial for my Strawberry Doughnut Pillow but I had to get this award business taken care of. I really do not want anyone to think that I am ungrateful. Tutorial will be out tomorrow - and the world will then be filled with millions of doughnut pillows. Because "what the world needs now, is doughnut pillows, sweet doughnut pillows. it's the only thing that theirs just too little of"... sing this to the tune of What The World Needs Now Is Love Sweet Love! Congrats Versatile Blog Award winners!!! PS. Only 64 more days until I get to eat birthday cake! Thanks for stopping by to see me injure myself from indoor skiing!! Newest follower.